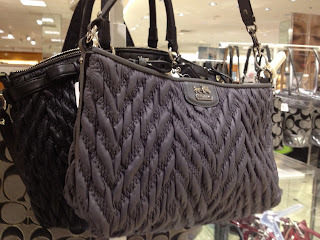 I was out shopping last weekend and swung by the purse department in Macy's to check out what they had. 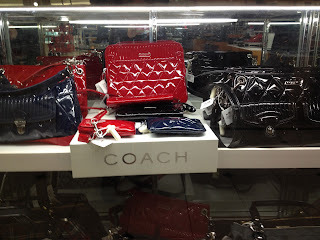 Some of the Coach bags caught my eye because they reminded me a little of Vera Bradley bags. The patent leather bags on the top photo have the diamond, quilt stitching like Vera Bradley signature bags and the in the photo below the coach bag looks like the Vera Bradley nylon collection that sold out...you can see a photo here.